Thank goodness for the Chincoteague Cultural Alliance! This Chincoteague arts organization is behind so many of the cultural events which enrich the Chincoteague Island community. In addition to the Movies in the Park, the Second Saturday Art Stroll and other events, the Chincoteague Cultural Alliance also sponsors a wonderful series of acoustic musical concerts. If you love listening to professional musicians playing “unplugged,” the 2012 Chincoteague Concert Series is truly a treat! 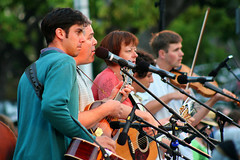 A lively and popular Scottish folk band, buy your tickets now. They’re popular for a reason! Traditional instruments such as tin whistles, bodhrans, bouzouki plus banjo, fiddle and guitar combine beautifully with three part harmonies and rich vocals. A skilled musician with wit and charm to boot, Ken returns by popular demand. Enjoy Celtic, Eastern European and other traditional selections played on a wide array of instruments including dulcimer, guitar, concert zither, Northumbrian small pipes, clarinet and more. The harmonious sounds of this classical ensemble are sure to please. Listen to soothing and moving chamber music performed on harpsichord, violin and cello. All concerts are performed at the Chincoteague Senior Services Center at 6309 Church Street. Tickets can be purchased at the door or 1-2 weeks before each event at H&H Pharmacy at 6300 Maddox Boulevard, (757) 336-3115 or Sundial Books at 4065 Main Street, (757) 336-5825. All Advance tickets are $15 and will be held at the door for pickup. Children 12 and under are free. Tickets bought at the door are $18. Keep in mind that all ticket sales are final! We hope you enjoy these delightful live music offerings during your stay at our Chincoteague B&B. If you need help making arrangements to see these shows, the staff at our inn near Assateague will be happy to help you.